Clocking in at 2 hours and 34 minutes with a reported budget of $195 million, expectations seemed to be running as high as per the thrill ride depicted in the trailer which has been making the round these past months. I was out for the very first showing in Toronto in Real 3D at 9pm EDT, Tuesday, June 29, 2011 at Empress Walk in North York in the Empire Extra Theatre. - I'll explain all that in a second. - The showing was not sold out but there were a number of people present. According to the movie posters, the real opening is July 1st so we're all seeing over a couple of days something of a preview? Before seeing the film, I scanned down the various articles on the Transformer series to confirm I'm not going out to a favourite with the critics. Rotten Tomatoes handed out 57% to the first film Transformers then 20% to the second film Transformers: Revenge of the Fallen. Movie number three in this series wasn't off to the best of starts as I saw a score of 36%. Don't forget than anything under 60% is not considered a winner. In fact, my advice would be to never bother wasting your time, never mind your money for anything less than 60%. At 37%, you're looking at something one step above dog crap. Michael Bay has managed in this third installment of the Hasbro toy chain brought to life - yes, this is based on a toy - to create a pummel your senses, toyish, brute form of entertainment that is going to be lapped up by the teen slash early twenties demographic. This is a cinematic version of a plate of suicide hot chicken wings. After one, never mind finishing the plate, your senses are so on overload I defy you to be able to detect anything less than a slug of Tabasco sauce. I saw the first film in the series and had forgotten my reaction to it. It's a toy. For kids. Like really young kids if I'm not mistaken. I'm betting the target age group (males 8 to 14?) are not even allowed into the theatre to see the films. I'm sorry. I'm an adult. I like adult films. Not something based on what an eight year old would like. At least the makers of Toy Story or Kung Fu Panda managed to bridge the gap providing entertainment which works for the two groups of adults and kids at the same time. But this? It comes back to what I've said before: you have to accept the initial premise. Whether it's the X-Men as mutants with special powers or Thor being a Nordic god or Green Lantern with his ring, you have to accept the premise or the rest of the story doesn't cut it. Without the premise the rest of the story makes no sense. The fan sites are awash with analysis and details about the film. I'm not going to bother to repeat what you can read elsewhere. I'm here to say that you shouldn't bother to see this film unless you're a diehard Transformers fan, you love special effects or you're so desperate for entertainment, you'll go see anything. The American actor John Malkovich has a small part in this film. John Malkovich. What the heck? Why is he in this film? What a sec! This guy can act, really act and he's in this film? Frances Louise McDormand? She won the Academy Award for Best Actress in 1996 for her role as Marge Gunderson in Fargo. How did she manage to say any of her lines in this film without cracking up? The screenwriter Ehren Kruger, who also wrote Transformers #2, managed to weave the Apollo moon landing into the plot (no spoilers). Who shows up for a cameo? Buzz Aldrin, the lunar module pilot of Apollo 11, the first manned lunar landing in history and the second human being to set foot on the moon, following mission commander Neil Armstrong. I have to chuckle though. Who under the age of 30 or even 40 would recognise him? In looking at the three films of the series, I had to say, "Wow" when checking out some of the figures. Okay, nobody can argue with the grosses. Holy Hannah, are these films money makers or what? I and all the critics in the world can diss these films but nobody, absolutely nobody can criticize how much money they're making. Good lord! Who cares what rating Rotten Tomatoes gives them. The public doesn't seem to be checking with Rotten Tomatoes. Filming was temporarily delayed on September 2, 2010 in Hammond, Indiana, when an extra was seriously injured during a stunt. The accident happened when a steel cable snapped from a car being towed, owing to a failed weld, hitting the extra's car and damaging her skull. The extra, identified as Gabriella Cedillo, had to undergo brain surgery. The injury has left her permanently brain-damaged, paralyzed on her left side and her left eye stitched shut. Paramount admitted responsibility for the accident, and covered all medical costs incurred by Cedillo. Nevertheless, on October 5, Cedillo's family filed a lawsuit, which cites seven counts of negligence against Paramount, D.W. Studios and several other defendants (not including Bay), with total damages sought in excess of US$350,000. On October 11, 2010, while filming a chase scene at 3rd Street and Maryland Avenue, SW, a Washington DC Metropolitan Police K9 Unit SUV struck the CamaroCamaro was severely damaged. We all know IMAX: big theatre, big sound system. The Empire theatre chain has gotten on-board with a new idea to spice up the joint and offer us movie goers a better cinematic experience. Empress Walk in North York has one dedicated theatre, cinema number one, which offers cushier seats, a better sound system and an all digital projection system. Amusing enough, just like IMAX, they have a short "pre-show" designed to show off the capabilities of the theatre. This show doesn't involve lasers but they do have two side projectors to give a bit of a light show. For me, the big, big feature of this new experience is reserved seating. Yep, I bought my ticket on-line and got to choose my seat. That seat was reserved so I didn't have to worry about showing up early enough to rush in when the doors opened to get the best seat. Now here's something even odder: my ticket was $11.99. What? That's the cheapest I've paid in the evening just about ever. Was this a special introductory price? I don't know but I'm going to keep my eyes open about that one. The CBC published a review of the movie by Eli Glasner. I had never heard of this gentleman so I looked up some of his other work and he seems to do film reviews. He's a good writer. But here's the curious thing: I thought his review of the movie was more entertaining than the movie. Plus, he published his review at midnight oh one so he must have rushed home from the cinema, pounded out his nine hundred words and clicked Send. Heck, I got tired and went to bed. This can wait until the morning. I'm not getting paid for writing a review and I'm guessing Mr. Glasner is. This film is just dumb, dumb, dumb. - Roger Ebert gave it just one out of four stars. - It is pretty much a pound your senses special effects extravaganza which in the end doesn't leave you wanting more, but leaves you uncaring and wanting to get on with the rest of your life. This is the film equivalent of empty calories. Ten minutes after I had left the theatre, my attention had turned to other things and for the rest of today, I will not be mulling over the film nuances of Michael Bay's subtle handling of the inner struggle of Optimus Prime, the Autobot leader at discovering his former mentor Sentinel Prime having become a baddie. A "baddie"? *laughs* Yes, that's the perfect term for an eight-year-old kid. Judging by the grosses of the other films, it stands to reason this film is going to make a ton of money. I have to ask myself who is going to see these films. There has to be a lot of eight year old kids at heart who love playing with Hasbro toys and eating suicide hot chicken wings. Its special effects -- and 3D shots -- are undeniably impressive, but they aren't enough to fill up its loud, bloated running time, or mask its thin, indifferent script. Transformers: Dark of the Moon (also known as Transformers 3) is the 2011 American science fiction/action film in the Transformers film series, directed by Michael Bay and produced by Steven Spielberg. 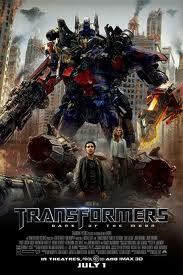 It is the sequel to Transformers and Transformers: Revenge of the Fallen and was released on June 29, 2011. The film is presented in regular 2D, Real D 3D and IMAX, featuring Dolby Surround 7.1 sound. Transformers is an American film franchise produced by Steven Spielberg, directed by Michael Bay and based on the toys created by Hasbro and Takara Tomy. The series is distributed by Paramount Pictures, DreamWorks, and United International Pictures. The first film, Transformers, was released in 2007 and the second and latest film, Transformers: Revenge of the Fallen, in 2009, with a third film, Transformers: Dark of the Moon released on June 29, 2011. Despite Michael Bay's confirmation on Dark of the Moon being his final installment in the franchise, Hasbro's CEO Brian Goldner has expressed his hopes for further films to be made with or without Bay.